Tree down on north shore trail just before aero-tech. Tree still there at noon. Be careful. Easy to get around tree but hard to see what’s on the other side. 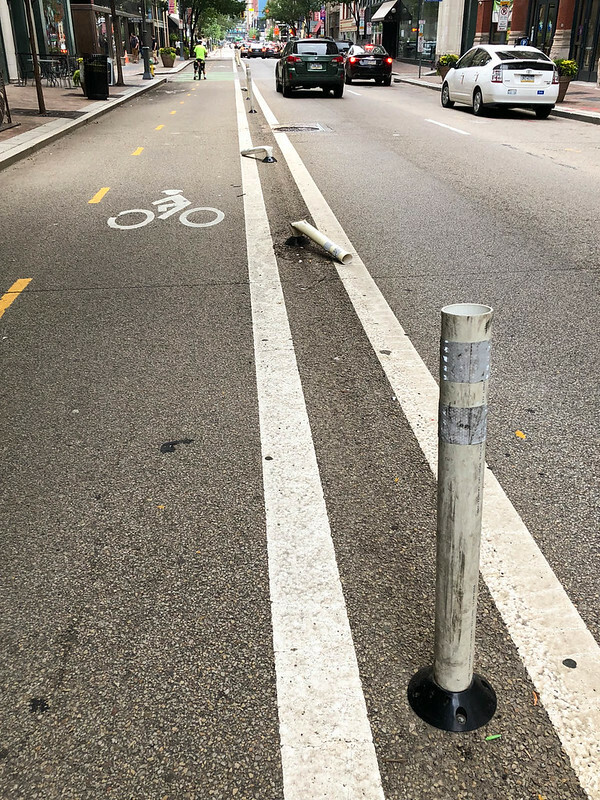 There are I think 8 plastic bollards on the Penn Ave bike lane bent to the ground between 11th St and Stanwix. Apparently a car or truck has driven over them. Please straighten or replace, as a bollard bent over like this is no longer effective at discouraging cars from invading the bike lane and endangering cyclists. Thanks. The attached photo from 928 Penn Ave shows three bent to the ground. I saw three plastic bollards bent down so far that they touch the ground on the Three Rivers Heritage Trail (Chateau Trail section). The one pictured is just south of Island Ave at latitude & longitude N40.46109 W80.03566. Apparently a car or truck drove over it. Bollards help keep cars off the trail and they protect cyclists and pedestrians from injury. Please straighten or replace the bent bollards. thanks. Thanks to both of you. I’ve 311ed.both of these areas repeatedly. Especially on the North shore trail they are rarely replaced. The excuse during the winter was that they were waiting on bollards. I think the issue now is that they are considered low priority. There are a total of 5 bollards down between the Casino and the Penitentiary. Some of this is conjecture , but I know the city runs a maintenance truck down the path at least every few days. I believe since they can’t go around the bollard they are going over them or trying to go around them and running over them with a tire. After a few trips the bollard won’t bounce back and stays bent over. The bollards need replaced but at the same time a long term solution is needed for the maintenance truck running over them every week. Is it the city or alcosan? They check all of the sewer outlets daily using a truck. Or is it people from the Marinas? The bollards are better than the old gates. Those sucked. You basically had to stop to get around them. But I agree that if they’re going to have bollards they need to be in Viagra position. What, pray tell, do they need to haul around with them every day that requires a truck? Can we find someone in the bike community to work with them to devise a plan for a bike trailer to which can be attached or loaded with the necessary equipment? Even if it’s a hundred pounds of stuff, it’s not like they have to pull it up a hill. 3 of the 5 are replaced. The 2 still down are on the ends (one at penitentiary and other at Cardello). My ride time has changed a little and I haven’t seen the truck in a while, but it was a city truck. At the same time Alcosan could be there and I just never see them. 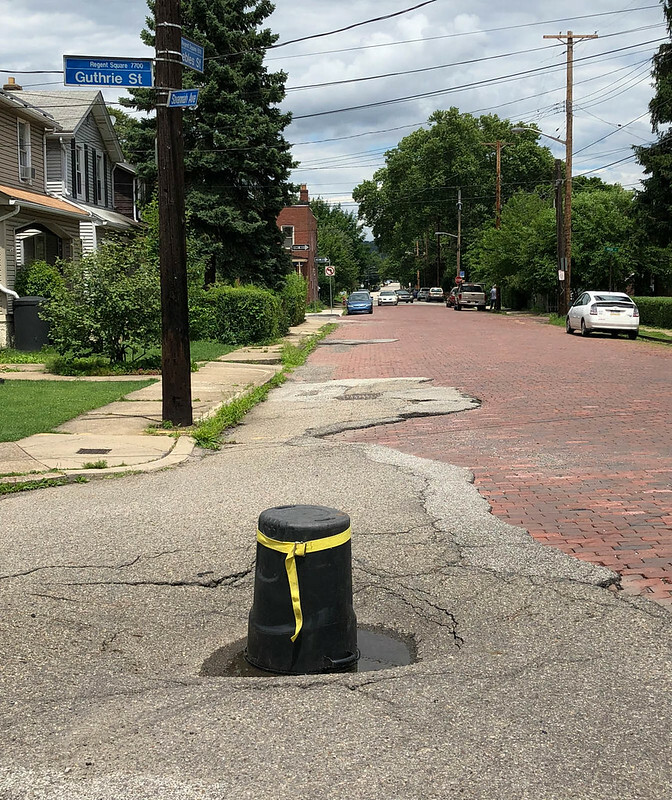 Regarding my Chateau-Trail-bollards-down request (https://www.bikepgh.org/message-board/topic/have-you-made-your-311-complaint-this-week/page/23/#post-353909), I got “The City of Pittsburgh Public Works Department has completed your request. Thank you for contacting us!“. So they only fixed 3 of the 5, as @jstalnaker2112 reported? I haven’t biked there recently, to check. Someone needs to 311 each individual bollard with pictures. I can probably do that Friday if I have time to ride the trail. grabbed one shot last night and one on way in this morning. @Pgh311 2 bollards still down on North Shore trail. jason — I just did the same thing this morning. I rode the NST from end to end today and 311ed the 2 bollards down. I also yet again 311ed the area behind the industrial park for weed pruning. Last week I 311ed the section between millvale and the 31st bridge for pruning. That’s all city of pittsburgh but good luck getting them there. And I also emailed millvale last week to have them take care of the section behind the boathouse, but they never respond to any emails, ever, or any contact forms from their website, or any tweets, etc. etc. The last bit I want to have taken care of is that huge bush outside the carnegie science center, by the submarine. It’s getting quite wide and the sightlines are super bad there. Hard to see peds on the trail. The science center needs to prune it back. I’ll send an email about that today. Just got tweets back from 311 that bollards on nst were replaced. I also 311ed the 2 dumped tires by Washington landing peds bridge and I emailed the Carnegie science center about a large bush on their property that needs (to be) trimmed. Dpw said they fixed all the bollards on Penn , Clemente bridge, and Allegheny center. Can someone verify? I’m in NYC. Bollards still down at Ridge & W Commons around Allegheny Circle, but Clemente, 6th, and at least the 600 block of Penn have been replaced along my morning route. Japanese Knotweed is cut down on the narrow section of North Shore Trail to Penitentiary. I actually only reported the E side of Allegheny Commons. They were too limited to check them all. Can you 311 the west side ones? Thanks. Should I 311 the non-functional water fountains in Schenley Plaza and gravel in the East St. bike lanes? Always. Cost of 311=free. So always 311 it. Back in pgh, back on the trail, back on Twitter @pgh311. I 311ed the very large tree branch that blocks 50 percent of the width of the north shore trail on the bridge between three rivers rowing and the 31st st bridge. Reported pothole on Forbes outbound by AJPalumbo Center. Couldn’t stop for a photo. @Pgh311 Pothole, Forbes Av outbound by AJPalumbo Ctr, R lane. Big enough to throw a cyclist. mini sinkhole in Guthrie St on west side of Peebles St. This problem is just inside Pittsburgh city limits (east side of Peebles is Wilkinsburg). Someone has set a garbage can in the depression, so people don’t drive into it! 1. missing bollard at SW corner of Penn & 6th. 2. bent bollard at SE corner of Penn & 7th (next to Benedum). 3. bent bollard at 908 Penn Ave.
4. bent bollard at 938 Penn Ave.
5. bent bollard at Penn & 12th. These bollards help protect cyclists in the bike lane, allowing them to feel more secure about cycling. Thanks. Re the bollards, that’s just sad. They were all replaced 2 weeks ago so the rate of bollard crushing is pretty.high. got a reply back from my month old tweet about trucks parked in the penn ave bike lane. Was pretty much a non-answer. We are currently investigating the best options to keep vehicles out of the bikeway, including coordinating with enforcement. any thoughts / need your help. I’ve been 31ing the overgrown shrubs on the north shore trail between 40th st br and 31st st bridge. 311 now says that DPW says that this is millvale, not pgh. The line between pgh and millvale is actually about 10 feet past where the 3 rivers rowing boathouse ends. It is actually in that very back parking lot, well before when the bridge starts. however, I’m sure pgh DPW won’t take any ownership of that trail bridge now. THey probably feel that they can stop at the 31st street bridge. Any suggestions on where I go from here? the peds/bike coordinator has never responded to any emails in the past from me. do I hit city council? If so, any idea who that person is for that area? Eric, that would be Council District 1 represented by Darlene Harris. Before you lose all hope, she is generally supportive of trail work. Bikes are fine as long as they don’t interfere with the almighty car. I’d also suggest contacting Valerie Biechner at Friends of the Riverfront and request that be the location of their next stewardship effort. I’d start with your own city council member, since part of that person’s job is to help their constituents (i.e. you) by working with other parts of the government. The city council member for the area with the problem isn’t trying to earn your vote, so at best you’re alerting them to something in their area that their own constituents perhaps couldn’t be bothered to complain about. Also, you might try replying to the DPW message by clarifying that you mean the part of the trail west of the Pittsburgh/Millvale border, “which as you know lies about halfway between the 31st and 40th Street Bridges”. Treat it as if they just didn’t understand which part of the trail you meant, and you’re helping to clarify that for them. It wouldn’t hurt to mention as specifically as possible where the problem is, in relation to the structures and the Pittsburgh/Millvale border. Maybe use Google Maps to make a little diagram with arrows for the border and the problem area, and send that to them as an attached image. Thanks. I don’t live in pgh city. I live in the burbs. I tried clarifying that it is really the city of pgh. I even sent a pic of where it was. Dpw is being lazy, I fear. whatever happened, the tree blocking 1/2 the width of the n shore trail bridge between 40th and 31st street is gone. The rest of the vines/bushes haven’t been trimmed there. Also, between Wednesday at 11 am and today yet another bollard was knocked down on the north shore trail, right by the W End Bridge. I already 311ed 2 being down between W End Bridge and Aerotech, so now there’s a third. I’m not going to re: 311 this since the original 311 request is still open. Will cross post in the road condition forum. Bollard man strikes again. 7 bollards down n shore trail. 11 down on Penn Ave bike lane. I 311es them all. Why do the bollards keep getting knocked down? Tall steel posts should be installed instead of the plastic pieces of junk that just keep getting knocked down. Cars run into them and they get knocked down, both on the north shore trail and on penn avenue. someone else somewhere on here posted a response from the city that they’re aware that bollards keep getting knocked down but they don’t have a plan to replace them with anything else. And, as you can see on the penn ave bike lane, for the areas where they get mowed down all the time, they just totally took out the bollards and have no separators (or, some orange traffic pylons) instead. riders run into hard metal ones and get hurt, and occasionally die. I’ve known folks in Pittsburgh who hurt themselves hitting the metal car-blocker bases on the Rte 28 trail (did this ever get a proper name? the sidewalk between Rialto and Penn Brewery along the base of Troy Hill…) and elsewhere, and it’s not that long since someone on a trail outside Cleveland hit a metal pole so hard he died from his injuries. 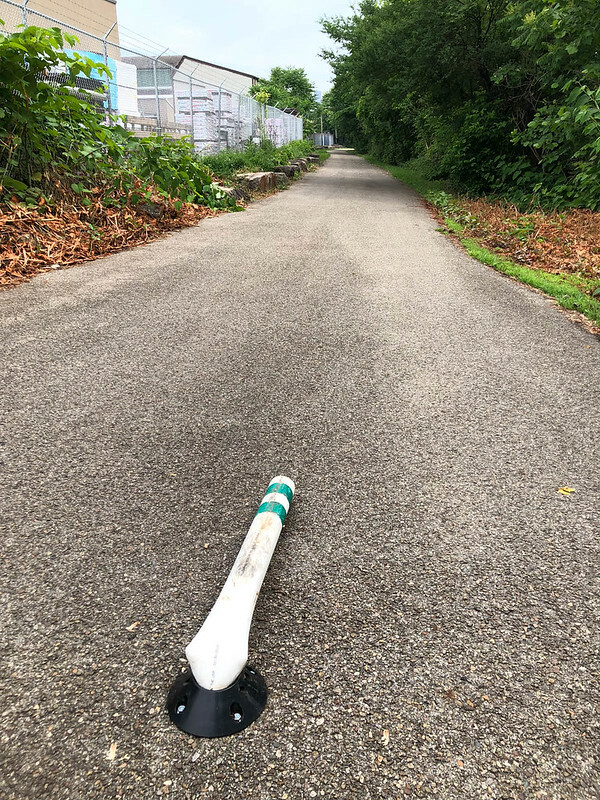 Out on the Steel Valley Trail portion of the Great Allegheny Passage, we have an on-road section of trail on East Waterfront Drive in Munhall near the Pump House (https://goo.gl/maps/sjwy5tAPZPw) marked by delineators (plastic bollards). One of our volunteers in the Steel Valley Trail Council, Bob MacGregor, checks the delineators almost daily, and replaces any that have become bent or damaged. We have delineators that are designed to flex and withstand some blows, but sometimes they break, and sometimes the bases detach from the asphalt. Compared to Penn Ave, we have the advantage of very few delivery vehicles making stops, but the disadvantages of being on the inside of a bend, and of high car speeds. I think Bob’s diligence at quickly replacing damaged delineators has (slowly) taught the drivers on that road that the delineators are here to stay, and that they should avoid them, if they want to avoid small dents to their front end, and loud noises.